Do you love the look of silver but not the work involved in keeping it beautiful? Do you avoid using your silver so that you don't have to polish it? Is your silver dull and tarnished? If you think about it, though, you know that it doesn't really take long to polish pieces of silver, after all. If you have the right materials and just a little time, your pieces will be looking like new in no time. See our tutorial on how to polish silver, with simple step-by-step directions. If a piece of silver just needs polishing, it has a gold or yellow tone. This is easily eliminated. But when pieces lose their finish or become very tarnished, you might need to have the piece professionally cleaned or re-plated. This is a process that requires a professional whose work takes several weeks and is very expensive. To avoid having to have your silver pieces repaired, just take a little time to take care of the silver pieces you have. Polishing an average bowl should take less than a minute, so it is definitely an activity with instant rewards! While the silver is still warm, use a moistened foam sponge to spread the silver polish. Spread the cream quickly over the silver piece to cover it completely. Gently rub each tarnished area. Move around the piece, inside and out, until the tarnish is gone. Wash with mild dish soap and rinse in warm water. Dry with a very soft cotton flour-sack towel to remove all water. Avoid using a silver tarnish dip except for pieces with small intricate cuts or curves or for the tines of a fork. The dips tend to leave a yellowish residue on silver. Also, you won't want all areas to be perfectly shiny. Darkened areas add beauty to the look of old and intricate pieces. When it's time to actually repair a piece of precious silver, contact a local company that repairs metal pieces. There are also online companies to which you can send your pieces. They can remove dents, replace bent, missing, or broken parts and add a new coat of silver plating. The result should be like a new piece. Store silver in special flannel bags infused with particles of silver that will retard tarnish on your stored pieces. Look for these in jewelry and department stores in the silver and china section. They are often brown and sold under the name Pacific Silvercloth. Be careful to keep the silver bags dry. Water causes them to lose their tarnish retarding properties. See more information about using silver in your home. Read about how easy it is to polish silver. Get some helpful tips and techniques to keep silver looking beautiful. Find links to sources where worn silver can be repaired or replated. 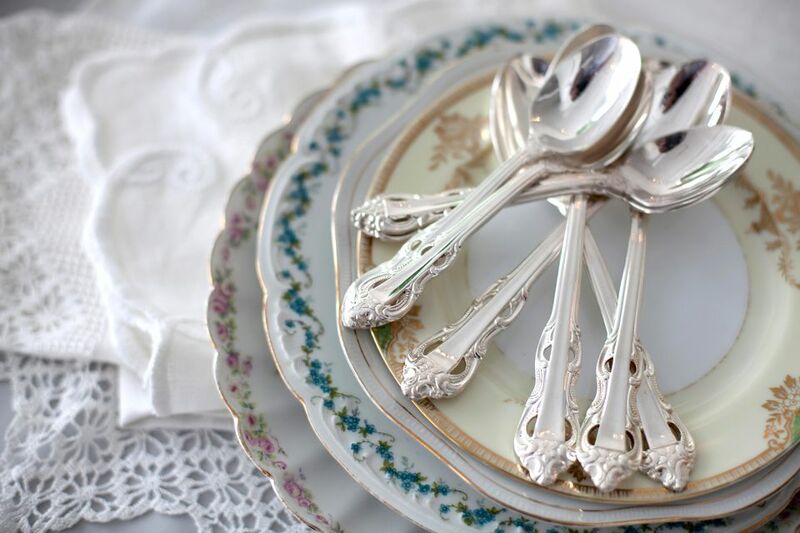 Tips on cleaning, maintaining, and storing silver and tableware. See some traditional serving pieces used at tea parties, including a cake plate, tiered cookie plate, crystal, silver, and more.